You’ve seen various leaks of the 2016 BMW 7-Series before, but the big Bavarian belle is finally making her official debut today. Here’s a screenshot from BMW’s official livestream, and even with a guy standing in front of it, you can tell it looks a lot like, well, a BMW. You can watch the livestream along with us here, but the main story here isn’t what’s happening on the outside, but rather what’s going on inside. BMW’s made a huge effort to put the 7 on a diet, and the car’s lost over 250 pounds thanks to extensive use of carbon fiber in its construction. UPDATE: Here’s a whole bunch more pictures, and some proper information. 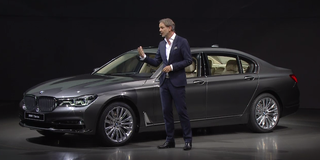 BMW claims that all that weight-saving has left the new 7-series with perfect 50-50 weight distribution over its axles, and the 444-horse V8 in the 750i x-drive, with the turbos nestled in the “V,” will help it get to highway speeds in just 4.4 seconds. 4.4 seconds. That is, frankly, absurd for a beast this huge. Though I don’t think that’s the craziest engine combo for the big 7, frankly. Sure, it’s got some diesel options, too, that mostly carry over from the last car, but what I like is the 740e. Not because it’s the most powerful, or the quickest, or anything, but because it sounds wonderfully complex. And a BMW 7 is nothing if not wonderfully complex. The hybrid “e” starts with a itty-bitty 2.0-liter turbocharged four-cylinder mill, and strapped to the transmission is an electric motor powered by batteries under the rear seats. But it shouldn’t be slow, not by anyone’s standards, with 322 horsepower combined being spat out by the twin-headed monster. Oh, and it’ll let you drive up to 25 miles, and up to 75 MPH, on electric power alone, supposedly. Though we’ll see what happens in the real world. Other electronic bits and bobs and gizmos abound, of course. The iDrive system now lets you use a touchscreen for a lot of things, and the standard air suspension can adjust for the road ahead of you using cameras, much like Mercedes’ Magic Body Control. Oh, and there’s this thing where the car will park itself remotely. Not just automatically, like in a Chrysler 200, but seriously remotely. Like, you can get out of the car and let the thing just park itself. If, you know, you trust it. Anyways, BMW says that production starts July 1st in “Dingolfing,” which is either really the name of BMW’s plant in Germany, or they’re just screwing with us. Either way, the car should be alright.